In his 2015 disruptive technology trends report, business futurist Brian Solis talks about the rise of “full-funnel marketing” and its effect on brands, agencies, publishers, and advertising technology companies. Why full-funnel? Because if you’re not offering compelling content for your target audiences wherever they are in the purchasing process, someone else will. In the old days, a marketer was golden as long as she worked hard to deliver dazzling creative that her C-suite loved. This is no longer the case. If you’re not paying attention to your marketing funnel, your job is at risk. Today, marketers must embrace their new role as drivers of revenue, and getting a handle on the funnel is step number one. 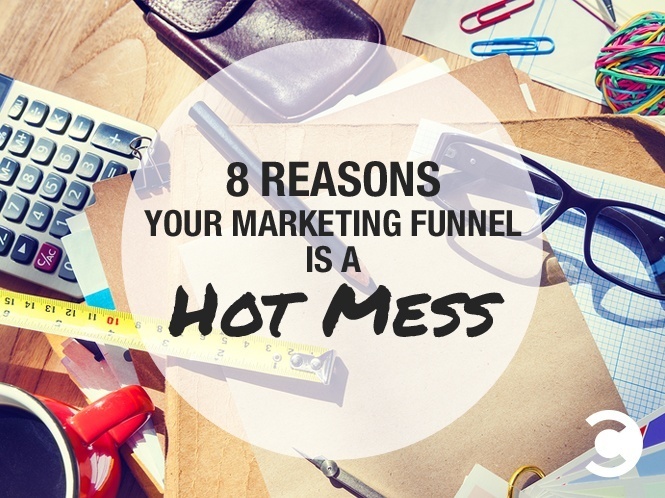 Here are seven signs that your market funnel is a hot mess. Datasheets. Email. Even hotter-than-hot mobile ads. If you’re stuck in a rut, hitting your audience with one or two kinds of content and calling it good, you’re losing ground. Today, you need a balanced and diverse content contributor team. Customers look to you for ideas and insight, as well as top-notch products and services. To get their dollars, you must start by getting their attention. Doing the same thing over and over, even if it’s good, can become predictable and tired—and fails to take advantage of all the opportunities available on the content color wheel. Who are your most important target audiences? What do they need from you before they know that they need you? That’s the Reach stage, where brand awareness reigns. What information, entertainment, or intrigue do you have to offer when you know a potential customer is “just looking?” That’s the Nurture. Your job is to inspire and inform, moving customers steadily toward the sale. What happens after the sale? You likely have a treasure trove of content for the Acquire stage—the product datasheets and sales aids that are standard fare. But it may be time for content that nurtures and educates current customers, as well as prospects. Marketers have relied on email since the dawn of the digital age, and it’s still a powerful vehicle for nurturing prospects. But today, it has its limits. For example, you probably already know that 95% of visitors to your website don’t leave you their email address as a calling card. But just because you don’t know their name or contact info doesn’t mean you can’t tap them lightly on the shoulder. After all, there are several things you DO know—what they did on your site, for example, how long they were there, and where they came from. All these factors combine to form precise profiles that you can and should use to engage and nurture anonymous visitors on multiple channels and devices. Today, it’s possible to extend your reach beyond the inbox with timely, targeted messages to prospects who aren’t yet ready to give you access to their inboxes. Then, when you do finally send email, you have a much higher chance of exceeding the paltry 20% open rate that is the industry average, according to LinkedIn data. To be there with a compelling and relevant message wherever a prospect shows up online, you have to use all the tools at your disposal, orchestrating communication across many mediums and finding ways to gain both broad and deep insight into customers, campaigns, and markets. Today’s best marketers take an approach that’s more Middle-Earth wizard than Don Draper salesman. Think about your own use of devices and social platforms throughout the day (the frequent interruptions and constant distractions), and you’ll begin to understand how necessary it is to connect with your audience from many different directions. Do you have a defined SEO strategy designed to increase credible backlinks to your website and raise its status in the “ongoing democratic opinion poll of the web”? Search remains a critical component of any online business strategy, and cannot be ignored. Are you approaching social sharing strategically? From the CEO on down, company employees should understand their role as brand advocates. To engage prospects when they’re most open and receptive, you need to know where your target audiences congregate, what they’re talking about, and how you might contribute to those conversations. Have you given up on paid media? If so, it’s time to reconsider that choice. Display and social ads today are about much more than a banner in the corner. These intelligent tools place your message in front of anonymous prospects at the precise moment that they’re looking for the information or experience you are offering. You don’t buy a car before doing some major research, and neither do your customers. Modern marketers know it takes multiple touches to convert a B2B or high-consideration B2C buyer into a sale. If you give credit for each sale to the last person the buyer spoke to, you don’t have the complete story. To be sure, it’s much simpler to measure only that final touch, but for improved visibility into the buying process, you should work toward a multiple touch attribution model. The more insight you have into the effectiveness of your nurturing techniques, the better you’ll be able to optimize them. When was the last time you went to lunch with someone on your sales team? Sometimes it’s good to start there. Marketing and sales have a long history of pointing fingers at each other, but in today’s full-funnel world, that attitude just won’t fly. You’re all in this together, and if sales is balking at your MQLs, it may be worth a look in the mirror. Are your marketing automation tools giving you clear insight into how prospects move through the funnel? Do you understand clearly what it looks like when a prospect is ready for human contact? Once you really get how your sales team defines various customer stages, you have a good chance of giving them what they need. When the deal is sealed, do you dust your hands off and move on to the next prospect? Or do you cultivate a deeper relationship? In the era of social networking, happy customers can be your most valuable marketing partners. Content at this stage should inspire loyalty, brand advocates, and repeat sales. If you’re hiding a hot marketing team behind a messy marketing funnel, it’s time to bring them out into the daylight of the new marketing era. Take control of your career and the future of your company, and put the customer journey at the center of your content strategy. Your C-suite will not be far behind.